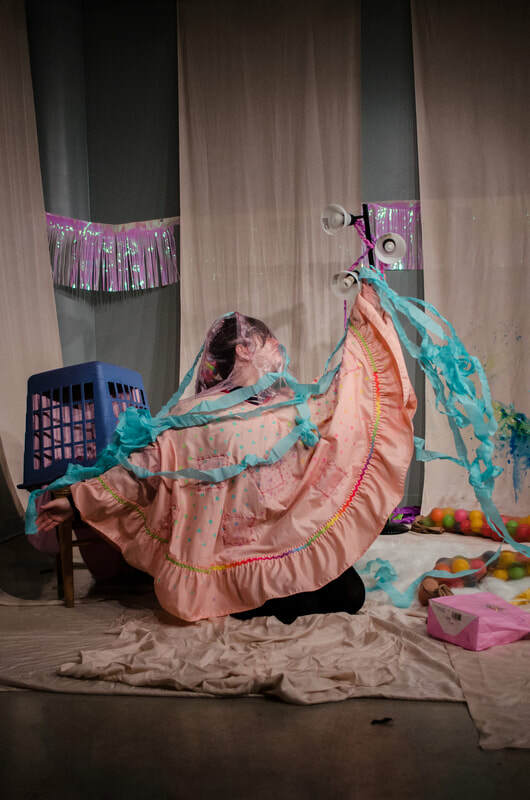 Bubble Gum uses a variety of mediums in her work, ranging from puffy painting balloons to videos of her eating carrots. Her most recent pieces revolve around installation, video performances, and fiber through which colour, pattern and texture are consistent focuses. Her use of fashion and textile techniques blend found, altered, and self-made clothing. Often blurring the line between studio play and everyday wear, Bubble Gum's expressive and playful re-interpretation of dress evokes a pleasure in fashioning the body and her true desire that life be a never ending rager of a party.